"Flipping! Do you flip stuff regularly or sometimes? Big ticket items or smaller high volume stuff?" "Pets - Did you used to do the Vendor pet sales? How have pet battles changed things for you"
I'm going to combine these two questions. I'm a bit risk averse so I tend to stay away from big flips. At the moment I'm leveling a second Priest to 90 on my Fiance's server. I don't like relying on him for gold so I've been making my own by flipping leveling greens and a few transmogrification items. Something I do really enjoy is flipping pets. I play on a much quieter server than that of my Fiance so it's often easier and cheaper to buy pets off of his auction house. I not only pick up pets for my own use but the majority of level 25 pets on his server cost 2-4k whereas they cost between 6-9k on mine. When I'm not sneakily buying pets for my own use I buy a few to resell on my own server. Pets which you don't pick up in the wild via battles or pets from achievements can be put into a cage and sold on the auction house. After you buy a pet and take it out of your mailbox upon clicking it you'll learn that pet and it'll show up in your pet journal. 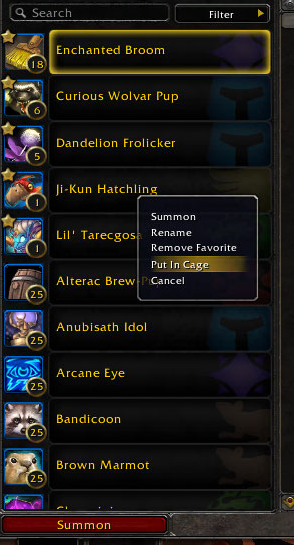 From there you can log any other server and open up your pet journal, right click on the pet and select Put in Cage and then re list the pet on the auction house of that server. This is a fantastic way to move gold between servers and great if you're looking to make some gold on a new server. The sales can be slow so don't be afraid to bark your pets in trade chat. Before pets became what they are now I did often buy and sell vendor pets. They were always a fantastic market, people were either too lazy to find the pets themselves or didn't know about blogs or site such as wowhead but either way I was happy to profit off of them. I haven't looked into them for a while with the way that pets work now but it may be something worth looking into! I've been getting more and more into the pet market. Particularly, I flip pets between ultra-high population servers, and medium population servers. This allows me to have gold across a lot of realms, without a great deal of risk. And then I can buy shiny objects (pets, mounts, mogs) for my friends and myself.